My Venetian cousins and their girlfriends were taking me to the hill-town of Asolo. On the way there, through the alpine foothills, we stopped for a quite lunch at an agrotourismo, a farm that produces the food they provide for lunch in a small restaurant on the property. After a wonderful meal we piled back in the car and headed off to our destination. 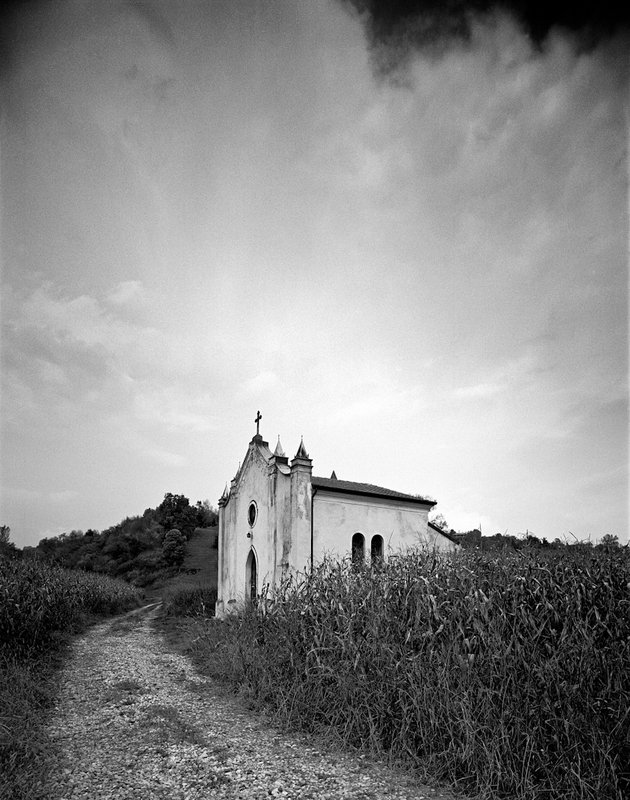 Just at the bottom of the hill from the farm, we came across a field of dried corn with a roadside chapel in its midst. I asked to stop because I felt a photograph. We all climbed out of the car and started walking down this gravel road as the afternoon clouds started to grow and thunder. I love the violent beauty of the weather along the foothills where afternoon storms are common. The glow of the clouds above the chapel was spectacular and I quickly set up the camera fully expecting it to start raining as soon as I was ready to release the shutter. The claps of thunder continued and the air smelled of moisture and ozone. A menacing combination that made my cousins uncomfortable. Trying to quiet them so I could concentrate, I said it wouldn’t rain till I was done. I took this photograph and we rushed back to the car. The moment we were all in it started to hail. Stunning Marco! I love how the path leads me in and then once I’m there, the sky expands consciousness in all directions….Wow!